María Julia Hernández, the founding director of Tutela Legal, died today of a heart condition at the age of 68. Tutela Legal is the human rights office of the Archbishop of San Salvador. She studied philosophy and law at the University of Central America in San Salvador. She worked with Archbishop Oscar Romero during his three years at the head of El Salvador's Catholic church from 1977-1980. From that time forward, Tutela Legal and María Julia Hernández have been some of the most credible and consistent voices regarding the protection of human rights in El Salvador. The legacy of a murdered archbishop and a polarized political situation creates a unique mixture of religion and politics in El Salvador. As I described in Saturday's post, Salvadorans commemorated the 27th anniversary of the assassination of archbishop Romero this weekend. The assassination was ordered by Roberto D' Aubuisson, founder of the ruling ARENA party. Sunday night I observed in several localities that local FMLN organizations were conducting rallies to commemorate the anniversary of Romero's death. They sponsored public showings of films about Romero and band concerts. 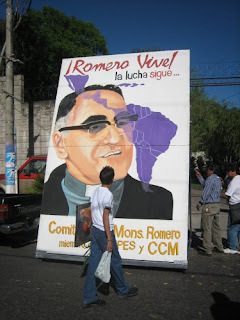 Shouts of "Que vive Romero! Que vive Farabundo Marti!" filled the air. The photo at the top of this post is from one of those rallies. I would like to appeal in a special way to the men of the army, and in particular to the troops of the National Guard, the Police, and the garrisons. Brothers, you belong to our own people. You kill your own brother peasants; and in the face of an order to kill that is given by a man, the law of God should prevail that says: Do not kill! No soldier is obliged to obey an order counter to the law of God. No one has to comply with an immoral law. It is time now that you recover your conscience and obey its dictates rather than the command of sin. The Church, defender of the rights of God, of the law of God, of the dignity of the human person, cannot remain silent before so much abomination. If your only source of news was the main Salvadoran newspapers, you might have missed the story. The sole survivor of a notorious massacre of civilians during El Salvador civil war passed away on March 6. On December 6, 1981, Rufina Amaya, had somehow managed to escape from the government troops who systematically rounded up and savagely murdered the elderly, the women, the men, the children and the babies in her village, including her 8 month old child who was ripped from her arms. This war crime, known as the El Mozote massacre, led to the deaths of as many as 1000 campesinos in and around the village of El Mozote in Morazan province. In the past two days, I visited two museums in San Salvador. The first was the David Guzman National Anthrpology Museum. 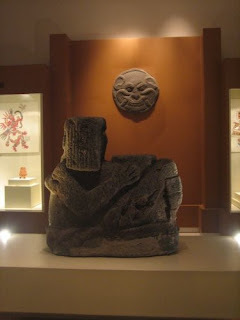 Once you go past the unimpressive entrance, you will find a very interesting collection of materials showing the evolution of Salvadoran culture beginning with indigenous cultures of the Mayans and other peoples. The museum is organized thematically, showing first the locations of human settlements in El Salvador, and then focusing on areas such as agriculture, religion, art, commerce and artisanship. There is a large collection of artifacts from archeological sites in the country. I recommend it to anyone visiting El Salvador. Next was the Museum of Art of El Salvador. This museum has a small permanent exhibition devoted to Salvadoran painters of the twentieth century. It provides an overview of various trends in modern Salvadoran art, but omits, somewhat surprisingly to me, the painter Fernando Llort. Four people tied to drug trafficking were arrested Tuesday on suspicion of being among those who orchestrated the killings of three Salvadoran politicians and their driver, Guatemala's interior minister said. Carlos Vielman said the four suspects ordered corrupt police officers to kidnap the lawmakers in February and bring them to an isolated, rural area outside of Guatemala City. Four police officers arrested in the case were later killed in jail. Another officer is still in custody, and a sixth is at large. Vielman said the four new suspects - three men and one woman whom he called drug traffickers - helped police search the parliamentarians' car for drugs and bought gasoline used to torch the vehicle and burn the four bodies. This biofuel is obtained through the fermentation of organic matter including manure, sewage sludge, municipal solid waste, biodegradable waste or any other biodegradable feedstock, under anaerobic conditions. Biogas is comprised primarily of methane and carbon dioxide. Installing a biodigester does not require in-depth technical knowledge or a major investment, as the cost runs to no more than 300 dollars. The equipment can be homemade, poses no health risks, and does not produce offensive odours, while it helps cut family fuel expenses. Biogas can be used as a fuel for vehicles or to generate electric power, and can also be burned directly for cooking, heating and lighting. The Salvadoran government is hunting down deadbeat parents who immigrated to the United States but failed to support the children they left behind. Calling unpaid child support a problem that devastates families in the Central American nation, El Salvador recently became only the third country in the Americas -- after Canada and Costa Rica -- to sign a bilateral agreement with the United States aimed at collecting money from deadbeat parents. Salvadoran officials hope that deadbeat parents might face serious consequences, such as deportation. They also are seizing property the parents own in their homeland and providing their names to immigration officials so they can be flagged if they try to re-enter El Salvador. You can now read for yourself the notification from the Vatican to Father Sobrino declaring that certain propositions in his writings "are not in conformity with the doctrine of the Church." There does not appear to be any sanction, punishment, or declaration that Fr. Sobrino may not teach or write in the future as had been previoiusly reported. The full text of the Notification can be found here. An Explanatory Note which accompanies the Notification can be found here. You may also want to read this comprehensive and balanced article by the LA Times. 30th anniversary of murder of Rutilio Grande, S.J. 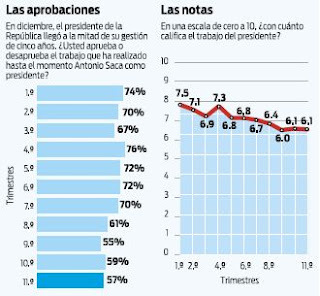 Polling by La Prensa Grafica shows Salvadoran president Tony Saca with positive approval ratings, but they are at the lowest point of his 2 1/2 years in office. The poll results show Saca with a 57% approval rating, down from 74% at the beginning of his term, and an average grade of 6.1 out of 10, down from 7.5. The responses show that crime was the item of greatest concern of those Salvadorans polled, and fully 70% believed that Saca was not achieving anything in reducing crime. A Jesuit theologian who is a leading exponent of liberation theology will soon be disciplined by the Vatican, according to the Spanish newspaper El Mundo. Father Jon Sobrino will be barred from teaching in Catholic schools and instructed not to publish written works, El Mundo reports, citing informed sources at the Vatican. The newspaper claims that the disciplinary measures will be announced by the Congregation for the Doctrine of the Faith within the next two weeks. Although I write about topics like justice, economics, politics and trade on this blog, the most-read entries, by far, have been those entries about Cruz Hernandez. Doña Cruz, was purported to be 128 years old before she died yesterday, which would have made her the oldest person who ever lived anywhere in the world. Although there are good reasons to doubt that she was quite this old, her life story is still a rich one of growing up and living an entire life in rural El Salvador. Although the government generally respected the rights of its citizens, protection of human rights was undermined by widespread violent crime, including gang-related violence, impunity, and corruption. The most significant human rights problems included harsh, violent, and overcrowded prison conditions; lengthy pretrial detention; inefficiency and corruption in the judicial system; violence and discrimination against women; abuses against children, child labor, and forced child prostitution; trafficking in persons; discrimination against persons with disabilities; discrimination against indigenous persons; discrimination against persons based on sexual orientation; and lack of enforcement of labor rights. Read the complete report on El Salvador here. On a parched corner of this Central American nation where searing heat and dust punish those who live here, Brendan McCleary leads a group of youngsters on a hike for an up-close look at the hemisphere's second-most deforested country. "It's hot here, right? Why?" McCleary, 24, asks the nodding children at a clearing in the sparse woods. "Because there are no trees," several shout. McCleary and Nathan Dollar, stationed at another community in the same region, are part of a reviving U.S. program that was launched by President Kennedy in 1961: the Peace Corps. We are sorry to bring sad news. Today, at 12:30 PM, Rufina Amaya, known around the world as the sole survivor of the infamous massacre at El Mozote (December 11, 1981), drew her last breath. She had gone into the hospital with respiratory problems and later a stroke. Due to complications with her diabetes and hypertension, she suffered multiple heart attacks and strokes in her final moments. Rufina gave birth to 11 children, only 2 survived, the oldest, Fidelia, and the youngest, Marta. The rest died either in the massacre or during the war. Recent events involving the murder of four Salvadorans in Guatemala have dominated the blogosphere in El Salvador. On February 19, three members of the Central American parliament (PARLACEN) from El Salvador's ruling ARENA party were found murdered in Guatemala along with their driver. The group had been traveling to a working group meeting of PARLACEN. The bodies were found in a rural area outside of Guatemala City, in the burned out shell of the vehicle in which they had been driving. Among the dead was Eduardo D'Aubuisson, son of the founder of ARENA. Initially the reaction in the Salvadoran blogosphere was to call for restraint[ES], avoiding a rush to judgment, and calling for an in depth investigation[ES]. Jjmar wrote that no one should seek to take advantage of the murders[ES] for political gain, whether to further the political polarization in El Salvador or to gain a benefit in the 2009 election campaign. This week marked the one year anniversary of the effective date for El Salvador of the Central American Free Trade Agreement (CAFTA). As was true when the treaty was adopted, the views of whether the agreement is benefiting El Salvador are sharply split. US and Salvadoran government officials praised perceived benefits of the treaty, saying that 29 new businesses have opened in El Salvador since CAFTA went into effect, and another nine have expanded their operations. Under El Salvador's constitution, obtaining an international loan requires a 2/3rds vote in the National Assembly. The FMLN lacks a majority in the National Assembly, but its legislative block has more than the necessary third to stop loan approvals. Currently the government has international organizations lined up to loan El Salvador $436.4 million. The loans, from the World Bank and the InterAmerican Development Bank, are designated for such purposes as basic education, improving rural roads, public safety, and Solidarity Net, the Saca government's anti-poverty program. The FMLN has so far blocked approval of these loans, insisting that it wants the results of audits of 16 prior international loans and scrutiny of how money which was previously borrowed has been spent.